TechConnect is a partnership between the Arizona Technology Council and Arizona Commerce Authority. Since 2005, TechConnect has been dedicated to covering innovation and technology in Arizona and beyond. It provides news and analysis about the region’s leading companies, emerging companies (and their technologies) as well as the latest industry trends and critical issues that are propelling Arizona’s technology ecosystem. Just last year, a blog was created for more up-to-the-minute tech news and easy-to-digest stories and the magazine was converted to a digital e-mag that is produced quarterly. From aerospace to biotech to nanotechnology, these are the disciplines setting the tone for Arizona’s future. 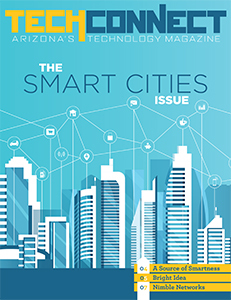 From university entrepreneurial assistance programs and award-winning researchers in our own backyard to the bioscience and semiconductor companies you should know about, TechConnect showcases Arizona’s technology community through profiles, feature stories, R&D analysis, entrepreneur spotlights and trend reports. Editorial content includes stories from writers based at Arizona State University, Northern Arizona University, The University of Arizona, the Translational Genomics Research Institute and Science Foundation Arizona. Additional contributions are drawn from experts on topics including international trade, global innovation, intellectual property, mobile marketing, technology trends, startups and much more. TechConnect provides a platform for Arizona’s technology community to showcase its work and innovation. To submit ideas or questions about stories, send an email to drodriguez@aztechcouncil.org. See past issues below.